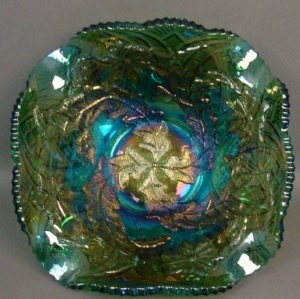 Pattern Description: Four leaves start at the center and whirl out toward the edge of these bowls. Four flowers sit along the outer edge between the leaves. The back pattern is called Fine Cut Ovals. 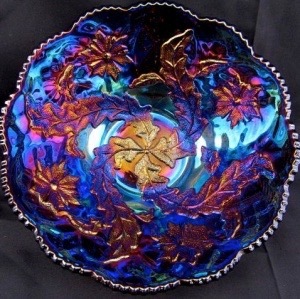 Whirling leaves is the interior pattern with leaves starting in the center and swirling out to the edge of the bowl, the exterior pattern is Fine Cut Ovals (unique to this interior pattern). The bowls measure between 9″ to 10″ and have a collar base. 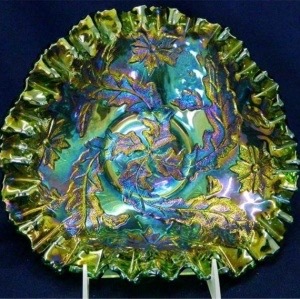 This bowl comes in various edge treatments, including round, ice cream shape, tri-cornered, ruffled, square, 3n1 and there was an example of one with a gold edge gilding. 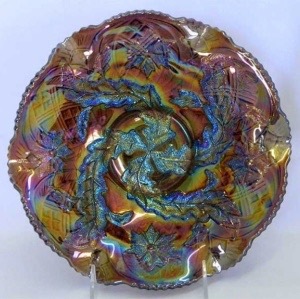 There is also an oblong bowl, measuring 10″ by 9 1/2″ (referred to as a whimsey shape).